I’m an overweight 30something who wants to be fit and slim… and an Ironman. My name’s Tamsyn and I’m three-fifths of the way through a five-year personal challenge. My original inspiration came from a group of athletes and coaches who I met whilst on a running holiday. I returned for an Embrace Sports Tri Camp in November 2013. There I was pushed outside of my comfort zone and achieved things that I never thought were possible. I continue to be inspired by the blog posts that I read every day and I endeavour to motivate others to achieve their fitness goals. I was excited to be selected as a SOAS Racing Brand Ambassador for 2014 (and am continuing in Team SOAS in 2017). Of the three triathlon disciplines, running is my strongest. I was at peak form in early 2012, so I’m doing everything in my power to get back there and then move beyond that level. After trying for over 2.5 years, I finally achieved a 5k PB (24:43) in December 2014. For the first 18 months of my challenge, I was coached by Ant Gritton, a triathlete who runs Run Camp before switching to Olly Drew from Solent Athlete. I don’t currently have a coach. I was a Coach in Running Fitness with Lordshill Road Runners until the end of 2016, but have decided to leave the club. As a new mum, I just can’t make the training sessions any more. I run several times a week and have completed five marathons. These were: Milton Keynes – April 2012; New Forest – September 2012 and 2013; Paris – April 2013 and Brighton – April 2014). I am not a good runner; I’m just enthusiastic. 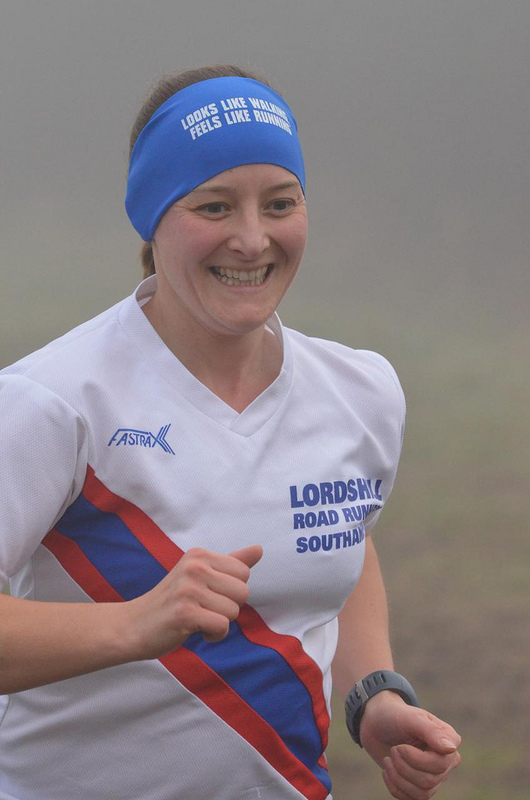 I run with SUTRI (University of Southampton Triathlon Club) and also do track sessions with Southampton Tri Club. I completed two half marathons in 2016 whilst pregnant and ran every week in my pregnancy, including a 30-minute parkrun on my due date. Swimming is the biggest challenge for me. Before December 2012, I had never put my face in the water when swimming. “Old lady breaststroke” was my preferred ‘technique’. I didn’t start learning to swim properly until my 35th birthday in February 2013. By May I was open water swimming and in June I completed my first aquathlon. I continued to have weekly swimming lessons for a year and joined Southampton Triathlon Club in December 2013, so I also attend several of their swimming sessions each week. My longest swim in 2014 was when I swam 2.8km in Weymouth. However, in 2015 I completed the Scilly Swim Challenge, which is 15-17.5km of swimming and 10km of walking around the Isles of Scilly, off the coast of Cornwall. I’m excited to be an ambassador for Swimathon in 2017. I have been cycling to work every day since September 2012… BUT it’s only about 5k/3 miles, so it doesn’t really count as training. My first race involving cycling was Winchester Duathlon on 17/03/13. I’ve now got the cycling bug, so I bought a road bike (and my first clipless pedals) in July 2013. I’m not the most confident cyclist (especially when going downhill in the rain), but I’m willing to persevere. I’ve also been working on my mount and dismount, in the hope that I can speed up T1 and T2. In 2015, I went cycling across Japan, which was an amazing adventure. I also signed up to support the YMCA’s Tour de Y event, cycling 360 miles from Ulverston/Lake Windermere to London in 4 days. I had not trained for it and had never cycled over 65 miles before, but the strength and conditioning work that I’ve done with Olly meant that I was capable of completing the event. I’m looking forward to offering more rides as a Breeze Champion. In 2016, I completed a 100-mile ride whilst 5 months pregnant. Unfortunately, my bikes were stolen in 2016, which prevented me from riding as much as I wanted to. An aspect of my life that has finally started to change since starting this blog is my continuing efforts to eat more healthily and lose weight. I only put on 7lbs whilst pregnant and currently weigh 9st 12lb (64kg). I want to get back to weighing 9st (57kg), however this year I’ve managed to lose a significant percentage of body fat, so am trying not to focus too much on the number on the scales. I’m a life-long vegetarian and I try to eat whole foods, but I have a sweet tooth! To help me meet my nutrition goals, I worked with Sam from Solent Strength + Nutrition (now Mealo) in 2015. I’m really looking forward to being an ambassador for The Athlete’s Palate in 2017. I did my first two triathlons in September 2013 and found the experience exhilarating. Although I didn’t have a 70.3 on my plan until 2015/16, my husband persuaded me to sign up for Challenge Weymouth 70.3 in September 2014. Despite the horrendous sea conditions, I loved the experience, so I signed up for Ironman Dublin 70.3 in summer 2015 and managed to smash my previous PB by over 42 minutes! I had to withdraw from Ironman Weymouth 70.3 in September 2016 (because I was pregnant). My main event in 2016 was Long Course Weekend (1.9km swim; 50-mile bike ride; 10km run). So I just stumbled on your blog… and you are rocking my socks! You are such an inspiration! Thank you! Wow! Ironman is my hero. Excited to follow along your journey! How very inspirational you are. I love it when people get out there to train and don’t let things get in their way, way to go! Wow. This might be one of the most complete blogs I have ever seen. Thank you for following mine as I will start following yours. I certainly can learn from your structure of your blog. We have similar interests and like to share them. Yours is an amazing journey. Thanks again. Thank you 🙂 I look forward to reading about your adventures. I think you linked everything but your email! You are really inspiring! Nice to meet you! Hi! I’m glad I came over your blog at Community Pool. Looks like you’re really into fitness! I’m sure you’re really healthy! It’s a good idea to do something about it on a blog! Thank you for the compliment! My dream job was becoming an author. I will keep moving. Thanks! HI, Tamsyn! Thanks for stopping by my blog and liking a post. I am enjoying my visit to your little corner of the blogosphere. Oh my gosh! You just described me in the first paragraph! I can’t wait to catch up on your blog. I’m sure you will be an amazing inspiration! Thank you 🙂 I just stopped by your blog and as someone who has battled depression in the past, I think we have quite a lot in common! May I ask…has triathlon played a part in recovery for you? Awesome blog and well done on your progress! Will entering training to do a marathon myself in 2017.